Objective: To compare 2 irrigation solutions in terms of postoperative pain after single-visit treatment of chronic apical periodontitis with pulp necrosis. Methods: A total of 126 patients requiring treatment of apical periodontitis and pulp necrosis were randomly assigned to 2 groups according to the solution used for irrigation: 5.25% sodium hypochlorite (NaOCl) or 2% chlorhexidine gel (CLX) (63 patients in each group). To assess postoperative pain, a questionnaire and pain intensity scale were administered at 24, 48 and 72 hours and 7 days after the procedure. The χ2 test was used to compare the intensity of pain with the 2 irrigation solutions. Results: No patients reported severe pain at any stage. Moderate pain was reported by 3% of patients (2/63 in each group) after 24 hours and by no patients beyond 24 hours, regardless of the irrigant used. Mild pain was more frequent but diminished rapidly (reported by 19% [12/63] of patients in the NaOCl group and 16% [10/63] in the CLX group at 24 hours, by 10% [6/63] in the NaOCl group and 11% [7/63] in the CLX group at 48 hours, by 3% [2/63] in both groups at 72 hours and by 2% [1/63] in both groups at 7 days). There were no statistically significant differences in postoperative pain between the 2 groups at any time point (p > 0.05). Conclusions: The incidence of postoperative pain after single-visit endodontic treatment of chronic apical periodontitis with pulp necrosis was uniformly low, regardless of the irrigant used. Sodium hypochlorite (NaOCl) solution is the standard irrigant for cleansing and disinfection of the root canal.3 It has antimicrobial and histolytic characteristics, among other properties.9 However, NaOCl may be cytotoxic to the periradicular tissues, particularly at high concentrations.10,11 As such, postoperative pain is a concern when highly concentrated NaOCl solutions are used in single-visit treatment of nonvital teeth because of the risk of extravasation of the irrigant into these tissues.12 Some investigators have suggested 2% chlorhexidine gel (CLX) as a good choice of irrigant for necrotic teeth because of its antimicrobial action, high substantivity and low toxicity.13,14 In addition, CLX may be less caustic than NaOCl.12 However, Mohammadi and Abbott5 reported that despite acceptable biocompatibility, CLX is also potentially cytotoxic and may induce allergic reactions, though rarely. Direct comparison of NaOCl and CLX in a randomized clinical trial, in terms of their influence on postoperative pain, was therefore warranted. The study described here involved in vivo assessment of the incidence of postoperative pain after single-visit endodontic treatment of patients with radiographically visible chronic apical periodontitis and necrotic pulp, with either 5.25% NaOCl or 2% CLX plus normal saline (0.9% NaCl) as the irrigant. This prospective randomized clinical study was approved by the São Leopoldo Mandic Center for Dental Research Ethics Committee (protocol no. 2008/0346). All patients were informed of the purposes of the study and provided written informed consent. The study was conducted in accordance with the provisions of the Declaration of Helsinki. 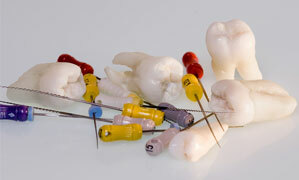 Patients who spontaneously sought care at the dental practices of the 2 lead investigators (G.A. and R.S.C. ), both trained endodontists with over 10 years of clinical experience, were recruited for the study. Patients were eligible for inclusion in the study if they had no relevant comorbid conditions; had received no antibiotics, anti-inflammatories or analgesics for at least 1 week before the study treatment; had no preoperative pain; and had a diagnosis of chronic apical periodontitis with periradicular bone loss and apical patency. Patients were excluded if they had calcified teeth, deep periodontal pockets, persistent exudate, or incomplete root formation, or if there was failure to achieve apical patency. Patients with immunosuppression or immunocompromise were also excluded. The study sample consisted of 126 patients, each seeking treatment for a single tooth (Table 1). Any patient seeking treatment for the target condition was eligible for inclusion, regardless of which tooth required treatment. To minimize allocation bias, the patients were randomly assigned to 2 balanced groups by means of a restricted adaptive randomization procedure. For one group, 5.25% NaOCl (Farmácia Fórmula & Ação, São Paulo, SP, Brazil) was used as the irrigant during treatment, and for the other group, a mixture of 2% CLX (Farmácia Fórmula & Ação) and normal saline (L.B.S, São Paulo, SP, Brazil) was used. After removal of caries-affected tissue, placement of rubber dam for isolation and establishment of access to the root canal, the pulp chamber was flushed with the designated irrigant by means of a 5-mL disposable syringe (Injex, Ourinhos, SP, Brazil) and a 20 × 0.55 mm needle (Nipromed, Sorocaba, SP, Brazil) so that the needle would stay loose inside the canal. Instrumentation was performed with a crown-down technique, using ProTaper Universal rotary files (Dentsply/Maillefer, Ballaigues, Switzerland) and hand files (K-files and Flexofiles, Dentsply/Maillefer). Initial exploration was performed with a size 10 or size 15 K-file, followed by S1 and SX rotary files. Coronal flaring was completed with size 4, 3 and 2 Gates–Glidden drills (Dentsply/Maillefer) in a crown-down fashion, respecting the natural anatomy of the canal, keeping a constant 5-mm distance from the radiographically determined apical limit and, in curved canals, going as far as the beginning of the curve. The preparation length was kept 1 mm short of the apical foramen, as defined by a Root ZX II apex locator (J Morita, Kyoto, Japan). Apical patency was determined with a size 10 or size 15 file, and irrigation with 2 mL of the appropriate solution for each group was performed each time instruments were switched. S1, S2, F1, F2 and F3 rotary files were used for shaping, followed by cavity refinement with a minimum size 25, 30 or 35 Flexofile, depending on the anatomy of the canal. Again, irrigation with 2 mL of the specified solution was performed each time instruments were switched. Apical patency was maintained with a size 10 file. After shaping, the smear layer was removed with 10 mL of 17% ethylenediaminetetra-acetic acid (EDTA) (Farmácia Fórmula & Ação) applied with an ultrasonic cavitation unit (Enac, Osada, Japan) for 3 minutes, followed by a final washout with 5 mL of 5.25% NaOCl for the NaOCl group or 10 mL of normal saline for the CLX group. Each tooth was immediately subjected to obturation with the warm vertical condensation (System B) technique, with gutta-percha and Pulp Canal Sealer EWT (Sybron Endo, Orange, CA, USA); back-filled by means of the Obtura II system (Obtura Spartan, Earth City, MO, USA); and dressed with Cimpat, a premixed, non-eugenol, temporary filling material in paste form (Septodont, Saint-Maur-des-Fossés, France), and Z-250 resin composite (3M, Sumaré, SP, Brazil). Each participant received a questionnaire for assessment of pain (on a self-explanatory scale) and determination of frequency of use of analgesics after the root canal procedure, to be filled out at 24, 48 and 72 hours and 7 days after completion of endodontic treatment. Each participant also returned in person for assessment. Pain was classified on a 4-point scale, where 0 = absent, 1 = mild (not requiring analgesia), 2 = moderate (relieved by analgesia) and 3 = severe (not relieved by analgesia). The Pearson χ2 test was used to compare pain intensity between the 2 groups at 24, 48 and 72 hours and 7 days after the procedure. The significance level was set at p = 0.05. The 126 patients, 80 women and 46 men, ranged in age from 18 to 59 years (median 38 years). All 126 patients completed the study and returned the questionnaires. For all time points evaluated, there were no significant differences between the 2 groups in terms of postoperative pain (p > 0.05) (Table 2). None of the patients in either group reported severe pain. Pain levels decreased with time elapsed since the procedure; the worst period was 24 hours after the treatment, when 2 (3%) of the 63 patients in each group experienced moderate pain. Unfortunately, it is difficult to objectively measure a patient’s level of discomfort; data for this variable therefore depend on subjective information provided by patients themselves and are subject to error. In this study, postoperative pain was measured by means of a questionnaire and a 4-point pain intensity scale, similar to methods used in several previous studies.24-27 In contrast, Figini and colleagues4 assessed pain according to only 2 levels: “discomfort” and absence of pain. Previous authors have assessed the toxicity of irrigating solutions and the severity of inflammation caused when endodontic medications contact the periapical tissues and have shown that these factors play a role in the occurrence of postoperative pain after single-visit treatment of teeth affected by apical periodontitis.3,11,28-30 However, previous studies have led to divergent opinions about the best choice of irrigant for optimal disinfection of the root canal system with the least possible damage to the periapical tissue.3,5,9,12,14 Therefore, a head-to-head comparison was chosen for this study of 2 chemical compounds in terms of pain occurring after endodontic treatment. The results of this study showed no significant difference, in terms of postoperative pain at any of the time points evaluated, between 5.25% NaOCl and 2% CLX when used for irrigation during single-visit endodontic therapy. The pain decreased with time, and by day 7 only 2% of patients in each group reported mild pain (not requiring analgesia). This information is clinically important, indicating that the main reason for postoperative pain is probably debris (contaminated or not) that is expelled outside the canal toward the periradicular tissue during debridement.22 Despite a wealth of in vitro comparisons of the activity and effectiveness of NaOCl and CLX,5,12,31 a review of the literature revealed no in vivoclinical trials comparing 5.25% NaOCl and 2% CLX with normal saline in terms of postoperative pain after single-visit treatment. Bashetty and Hegde32 conducted a randomized comparison of 5.25% NaOCl and 2% CLX in patients undergoing multiple-visit treatment for a variety of dental conditions. They found a significant difference in postoperative pain at 6 hours after the procedure but no significant differences at any other point in time. In contrast, there were no significant differences in postoperative pain in the current study, probably because sample selection was restricted to patients with chronic apical periodontitis undergoing single-visit treatment. Both of the irrigants tested in this study (5.25% NaOCl and 2% CLX gel with 0.9% NaCl) were associated with low rates of postoperative pain among patients undergoing single-visit endodontic treatment for chronic apical periodontitis with pulp necrosis. It is likely that as long as the selected irrigant is kept inside the root canal by means of a low-pressure irrigation technique, postoperative pain and flare-ups can be avoided. Dr. Almeida is course coordinator, division of endodontics CIODONTO, Ilhéus, BA, Brazil. Dr. Marques is assistant professor, division of endodontics CIODONTO, Ilhéus, BA, Brazil. Dr. De Martin is assistant professor, division of endodontics, Center for Dental Research, São Leopoldo Mandic, Campinas, SP, Brazil. Dr. Bueno is course coordinator, division of endodontics, Center for Dental Research, São Leopoldo Mandic, Campinas, SP, Brazil. Dr. Nowakowski is assistant professor, department of restorative dentistry, University of Manitoba, Winnipeg, Manitoba. Dr. Cunha is assistant professor, division endodontics, department of restorative dentistry, University of Manitoba, Winnipeg, Manitoba. Peters LB, Wesselink PR. Periapical healing of endodontically treated teeth in one and two visits obturated in the presence or absence of detectable microorganisms. Int Endod J. 2002;35(8):660-7. Sathorn C, Parashos P, Messer HH. Effectiveness of single- versus multiple-visit endodontic treatment of teeth with apical periodontitis: a systematic review and meta-analysis. Int Endod J. 2005;38(6):347-55. Zehnder M. Root canal irrigants. J Endod. 2006;32(5):389-98. Figini L, Lodi G, Gorni F, Gagliani M. Single versus multiple visits for endodontic treatment of permanent teeth: a Cochrane systematic review. J Endod. 2008;34(9):1041-7. Mohammadi Z, Abbott PV. The properties and applications of chlorhexidine in endodontics. Int Endod J. 2009;42(4):288-302. Epub 2009 Feb 7. Peters OA, Peters CI, Schonenberger K, Barbakow F. ProTaper rotary root canal preparation: effects of canal anatomy on final shape analysed by micro CT. Int Endod J 2003;36(2):86-92.
van der Sluis LW, Shemesh H, Wu MK, Wesselink PR. An evaluation of the influence of passive ultrasonic irrigation on the seal of root canal fillings. Int Endod J. 2007;40(5):356-61. Epub 2007 Mar 27. De-Deus G, Garcia-Filho P. Influence of the NiTi rotary system on the debridement quality of the root canal space. Oral Surg Oral Med Oral Pathol Oral Radiol Endod. 2009;108(4):e71-6. Okino LA, Siqueira EL, Santos M, Bombana AC, Figueiredo JA. Dissolution of pulp tissue by aqueous solution of chlorhexidine digluconate and chlorhexidine digluconate gel. Int Endod J. 2004;37(1):38-41. Dunavant TR, Regan JD, Glickman GN, Solomon ES, Honeyman AL. Comparative evaluation of endodontic irrigants against Enterococcus faecalis biofilms. J Endod. 2006;32(6):527-31. Tanomaru Filho M, Leonardo MR, Silva LA, Anibal FF, Faccioli LH. Inflammatory response to different endodontic irrigating solutions. Int Endod J. 2002;35(9):735-9. Jeansonne MJ, White RR. A comparison of 2.0% chlorhexidine gluconate and 5.25% sodium hypochlorite as antimicrobial endodontic irrigants. J Endod. 1994;20(6):276-8. Wang CS, Arnold RR, Trope M, Teixeira FB. Clinical efficiency of 2% chlorhexidine gel in reducing intracanal bacteria. J Endod. 2007;33(11):1283-9. Gomes BP, Ferraz CC, Vianna ME, Berber VB, Teixeira FB, Souza-Filho FJ. In vitro antimicrobial activity of several concentrations of sodium hypochlorite and chlorhexidine gluconate in the elimination of Enterococcus faecalis. Int Endod J. 2001;34:424-8. Weiger R, Rosendahl R, Lost C. Influence of calcium hydroxide intracanal dressings on the prognosis of teeth with endodontically induced periapical lesions. Int Endod J. 2000;33(3):219-26. Waltimo T, Trope M, Haapasalo M, Orstavik D. Clinical efficacy of treatment procedures in endodontic infection control and one year follow-up of periapical healing. J Endod. 2005;31:863-6. Gesi A, Hakeberg M, Warfvinge J, Bergenholtz G. Incidence of periapical lesions and clinical symptoms after pulpectomy--a clinical and radiographic evaluation of 1- versus 2-session treatment. Oral Surg Oral Med Oral Pathol Oral Radiol Endod. 2006;101(3):379-88. Molander A, Warfvinge J, Reit C, Kvist T. Clinical and radiographic evaluation of one- and two-visit endodontic treatment of asymptomatic necrotic teeth with apical periodontitis: a randomized clinical trial. J Endod. 2007;33(10):1145-8. Penesis VA, Fitzgerald PI, Fayad MI, Wenckus CS, BeGole EA, Johnson BR. Outcome of one-visit and two-visit endodontic treatment of necrotic teeth with apical periodontitis: a randomized controlled trial with one-year evaluation. J Endod. 2008;34(3):251-7. El Mubarak AH, Abu-bakr NH, Ibrahim YE. Postoperative pain in multiple-visit and single-visit root canal treatment. J Endod. 2010;36(1):36-9. Kells CE. Immediate root-filling. Dental Cosmos. 1887;29:366-7. Siqueira JJ, Barnett F. Interappointment pain: mechanisms, diagnosis, and treatment. Endod Topics. 2004;7:93-109. Siqueira JF Jr., Rocas IN, Favieri A, Lima KC. Chemomechanical reduction of the bacterial population in the root canal after instrumentation and irrigation with 1%, 2.5%, and 5.25% sodium hypochlorite. J Endod. 2000;26(6):331-4. Glennon JP, Ng YL, Setchell DJ, Gulabivala K. Prevalence of and factors affecting postpreparation pain in patients undergoing two-visit root canal treatment. Int Endod J. 2004;37:29-37. DiRenzo A, Gresla T, Johnson BR, Rogers M, Tucker D, BeGole EA. Postoperative pain after 1- and 2-visit root canal therapy. Oral Surg Oral Med Oral Pathol Oral Radiol Endod. 2002;93(5):605-10. Yoldas O, Topuz A, Isci AS, Oztunc H. Postoperative pain after endodontic retreatment: single- versus two-visit treatment. Oral Surg Oral Med Oral Pathol Oral Radiol Endod. 2004;98(4):483-7. Oginni AO, Udoye CI. Endodontic flare-ups: comparison of incidence between single and multiple visit procedures in patients attending a Nigerian teaching hospital. BMC Oral Health. 2004;4:4. Soltanoff W. A comparative study of the single-visit and the multiple-visit edodontic procedure. J Endod. 1978;4(9):278-81. Kvist T, Molander A, Dahlen G, Reit C. Microbiological evaluation of one- and two-visit endodontic treatment of teeth with apical periodontitis: a randomized, clinical trial. J Endod. 2004;30(8):572-6. Bashetty K, Hegde J. Comparison of 2% chlorhexidine and 5.25% sodium hypochlorite irrigating solutions on postoperative pain: a randomized clinical trial. Indian J Dent Res. 2010;21:523-7.